The June 1992 edition of "The Waveney Life Magazine" includes a quaint little story written by local Beccles man Bob Aldous about the first car he bought in 1929. "It cost just £25," Aldous writes. "We called it 'the covered wagon' although in fact it was a 1925 Jowett 7 h.p. [horse power] car. The purchase was made from the late Mark Knights of Beccles in 1929." "I handed him [Knights] the money and asked him how to drive it! That was no problem, he said, pointing out the gears, the clutch and the brake. He bade me jump in and drive off! Well, after all, there were no such things as driving tests in those days..."
"After the first week I reckoned I was a pretty good driver. So, on the Saturday morning I drove along London Road in Beccles at a smart lick. It hadn't at that stage occurred to me that you should slow down before taking a forty-five degree turn. My visit to the garage that morning was, to say the least, a little unorthodox. 'The covered wagon' entered through the showroom window! 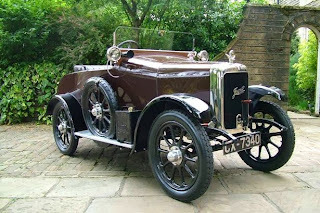 Neither I nor the Jowett sustained any damage, but it didn't do the window much good nor some bicycles which were on display..."
On the 1911 census returns Mark Benedict Knights was listed as an Engineer's Apprentice. Some time after the First World War I believe he took up a business partnership with Laurence Durrant. Mark married late in life to Olive Gertrude Rayner, in 1932. They had at least four known children, three daughters and one son. style or firm.—Dated this 28th day of December 1950. 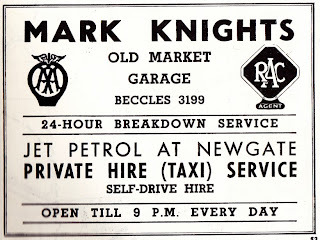 (20 March 1953) Beccles & Bungay Times newspaper: SALTGATE FILLING STATION: An application by Mr M Knights of Old Market Garage for development of the Saltgate frontage with petrol pumps came before the Town Council. He agreed: 1.) To stop using the two pumps in Old Market. 2.) No adverts on Saltgate. 3.) The wings should be planted with suitable trees instead of flowers. 4.) The main wall on the west side of the building be constructed of good quality red facing bricks and carried 3 feet above the eaves of the building. 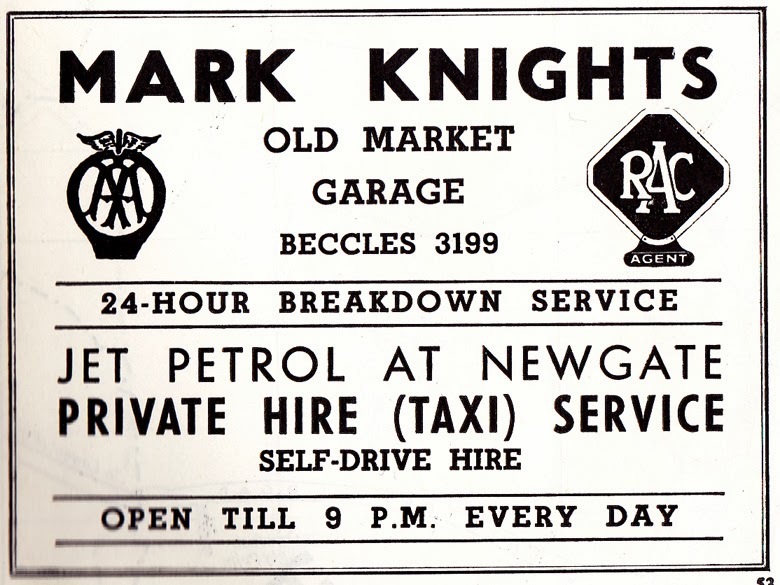 Mark Benedict Knights died at Northgate Hospital in Great Yarmouth in 1964, aged 68.